Here I have the Nails Inc. 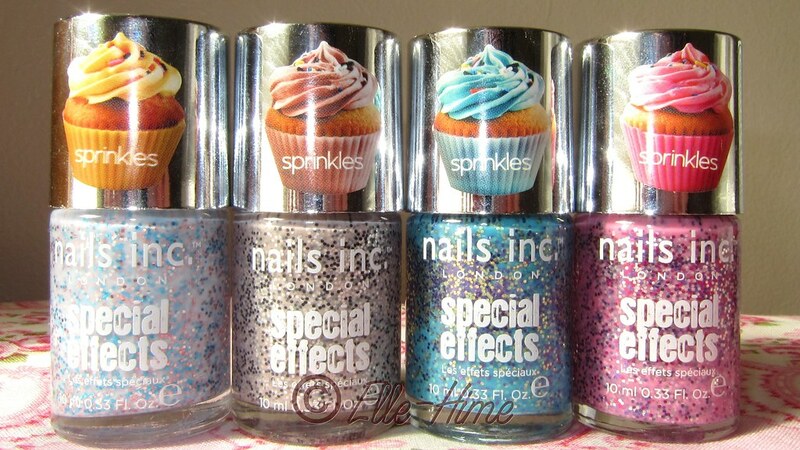 Sprinkles polishes from Sephora. It seems that many big name brands are taking note of indie polish brands making amazing glitter-in-creme/jelly concoctions that everyone wants. So, did Nails Inc. get it right? Wwwell, yes and no. First more details about this collection, though. These polishes are marketed as part of the "Special Effects" range of Nails Inc. polishes, nested in with finishes like crackle, matte topcoat, magnetic polish, and textured manicure kits. My eyebrow does go up at the fact that the brand calls glitter a special effect, but at least they keep these ones the same price as their "regular" nail polish. That price is $9.50 for 10ml. I didn't realize that these were only 10ml nail polishes, and while I may never used that much, it stinks that they are so pricey when in all honesty the formula just isn't that good. 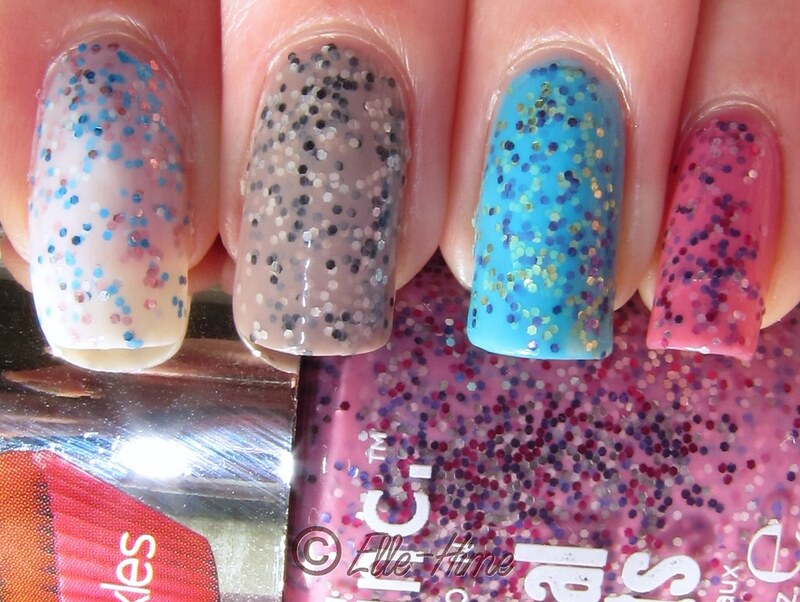 The consistency seems too slippery for the amount of glitter they are trying to put on your nail. The glitter, although small and should-be-managable, had a habit of gathering in one spot if I wasn't careful. While the color combinations are very cute and yes, it does look like you have sprinkles on your nails, I just didn't love them as much as I wanted to. Sephora incorrectly labels this polish as being "Sweets Away" on the website, which is silly since all these polishes have street-themed names. This is the one that I loved when I first heard about the collection and the one I wanted the most. It's so me, right? While I do love the colors it was the biggest let down on the nail. Three coats and the base was still a streaky, patchy white. I'm going to give it another try over a white base some time, I think it would help. Um, pastel grey base color? Sephora, Nails Inc London, are we looking at the same polish? This is a taupey-neutral color that leans more towards being khaki than grey. But let me say that I would totally live on Sugar House Lane; it sounds delightful. I wanted this polish second most of all. Black and silver (not matte white, people! They couldn't be too indie!) glitters make for an ice cream-esque nail color. Out of the entire collection this one looks the most dull, but it has it's own charm. It seemed to have a better formula, as well. I liked this one more than I expected. The bright blue base is cheery and I'm far more fond of purple than navy, so yay! And while I don't wear gold it looks more yellow-to-green in the blue base. I was pleasantly surprised by this color. I didn't know if the pink base would clash with my skin tone terribly, but I think this bright pink could be worn by anyone. The glitter colors are very pretty. I had trouble with the glitter bunching up on my pinky nail, but it did all right on my thumb. I used top coat on all my nails, a must for them to look decent because the polish formula isn't thick enough for the glitter to sink in nicely. These had decent wear but removal was a nightmare. The glitter stuck stubbornly. Blah. Would I recommend these? No, not really. I'm much firmer in my opinion of Nails Inc. being overpriced since trying these. Yes, these are cute polishes and pretty unique but I feel that our indie brands and etsy sellers in general are doing better by us, both in quality and price! Have you tried these? Did you want these? Do you think I'm crazy for posting such things? I don't know, it seems that all the swatches I saw before buying made these sound pretty great, but I'm startled to find they are just average! I love them all!!! Your nails are killah!!!! I like these! I saw them at sephora and ended up buying only sweets away! I think these are really fun for the holidays. They do make a nice set - it would have been nice if they were offered as a complete (and discounted) set of 4! actually, the more i look at them the more i want them all..problem. Haha, they do have a way of making you want them all! After careful consideration I am going to part with Pudding Lane, though. I don't think I'll reach for it enough to justify keeping it.